Peter Barlow was self-educated but this education was sufficiently good that he was able to compete successfully to became an assistant mathematics master at the Royal Military Academy at Woolwich. He was appointed to the post in 1801 and he began publishing mathematical articles in the Ladies Diary and he became sufficiently well established as a leading authority on mathematics that after a while he was asked to contribute various articles on mathematics for encyclopaedias. In addition to these articles, Barlow also published several important books, for example in 1811 he published An elementary investigation of the theory of numbers and three years later he published A new mathematical and philosophical dictionary. ... was considered so accurate and so useful that it has been regularly reprinted ever since. In the mathematical library at the University of St Andrews we have several well worn copies of these tables which must have been used intensely for many years. Today, however, they are only of historical interest since they were made completely obsolete by calculators and computers. The "Barlow lens", a modification of this telescope lens, is a negative achromatic combination of flint glass and crown glass. These were not his only contributions, however. In 1817 he published Essay on the strength and stress of timber which contains data he collected while conducting experiments at the military establishments in Woolwich. He also worked on the design of bridges, in particular working from 1819 to 1826 with Thomas Telford on the design of the bridge over the Menai Strait. It was the first major modern suspension bridge. Westminster Bridge was built across the Thames in London, despite opposition from city merchants, in the 1740s and rebuilt by Charles Labelye in the 1750s. However when there was a move to demolish and replace this old bridge in the 1820s, Barlow was consulted to compute how the tides on the Thames would be affected by the removal of this structure. After Barlow reported, New London Bridge was designed by John Rennie Sr and built by his son John Rennie Jr.
Barlow was active during the period of railway building in Britain. George Stephenson was the first to build railways in Britain. In 1825 the first train ran from Darlington to Stockton while the 30-mile line from Liverpool and Manchester was opened to traffic in 1830. Stephenson, who constructed both projects, believed that gradients should be less than 1 percent and that curves should have very wide radii of at least a kilometre. 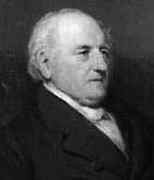 Barlow was appointed as royal commissioner for railways and in the 1830s and 1840s he conducted several experiments to see if the limitation on gradients and radius of curvature proposed by Stephenson was correct. He also tried to determine the most efficient shape for the rails.